The purpose of an H&l meeting is to carry the message of recovery to addicts who do not have full access to regular Narcotics Anonymous meetings. These meetings occur in hospitals, treatment centers, correctional facilities and adolescent institutions. There is no clean time requirement to join the Capital Area H&l Subcommittee, however to sit in as a panel member you need 90 days clean time and to speak or chair a commitment, you need 6 months clean time. 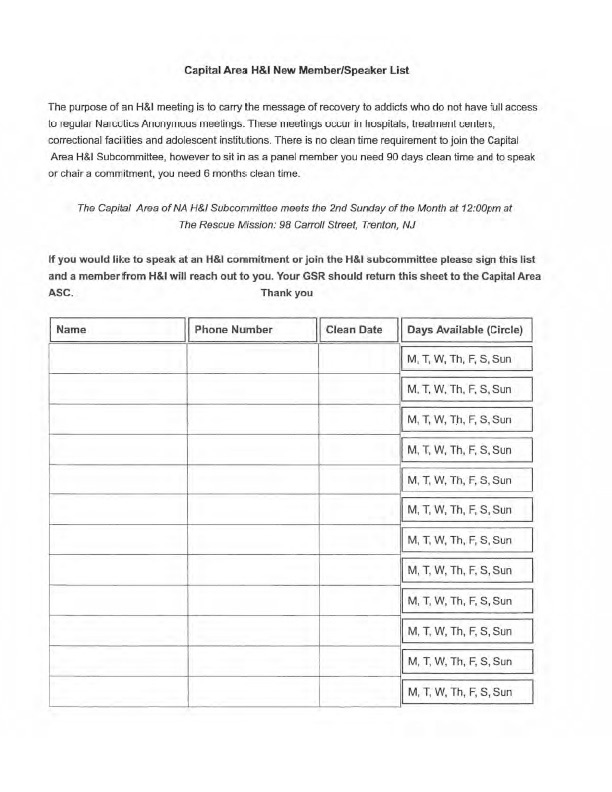 If you would like to speak at an H&l commitment or join the H&l subcommittee please sign this list and a member from H&l will reach out to you. Your GSR should return this sheet to the Capital Area ASC.